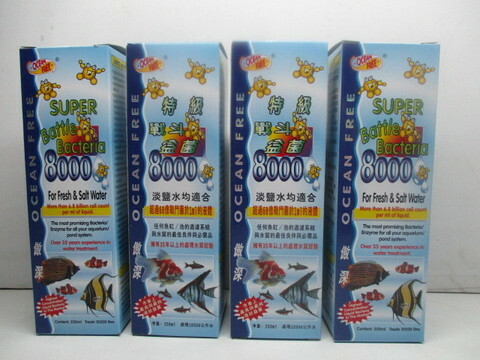 Super Battle Bacteria 8000 (Liquid type) Highest concentration of stable purified liquid bacterial spores and excellent extra cellular enzyme production. Special "Denitrification" by Ocean Free Super Battle Bacteria. (Convert the toxic ammonia to nitrite, nitrite to nitrate, nitrate to nitrogen gas). Control odors while reducing the C.O.D. and B.O.D. Not only Aerobic & Anaerobic but also facultative growth capabilities. Solve green water and algae problem and help to prevent fish disease. For new & old tank/pond. Fast establishment. More effective and speedy regenerating to aquatic plants/under gravel filter gravels. Effective PH range: 5.0 - 9.5. Effective temperature range: 5°C - 50°C (40°F -120°F). For maintenance, add 1m per 42 litre of water. 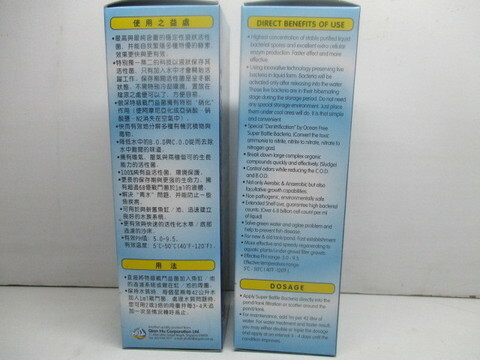 For water treatment and faster result, you may either double or triple the dosage and apply at interval 3-4 days until the condition improves.